Hello and welcome to another edition of Mastication Monologues! If you’re thoroughly confused about my title, it’s a reference to “Tutti Frutti” by Little Richard and one of the many foods I tried over this past weekend in Gyeongju. 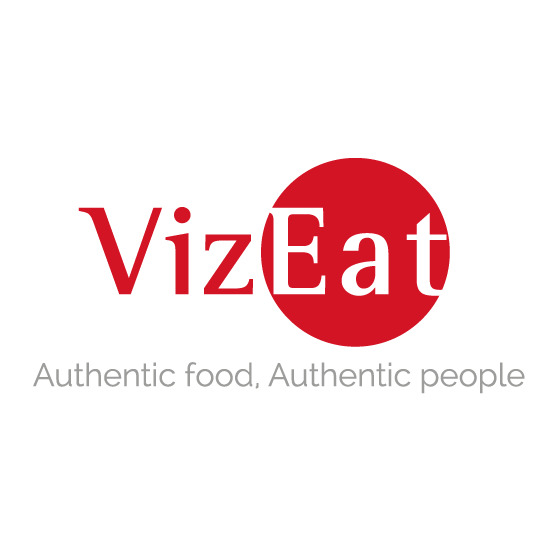 It was a great time where not only did I enrich myself in terms of friendships but also in food knowledge. Gyeongju is located in the southern part of the Korean peninsula, and we were going there by bus to see the cherry blossoms. Ergo, we stopped at Korean rest stops along the way to stretch and get the old bones moving again. I soon realized that Korean rest stops are a lot more intense than rest stops in the US. First, there are so many different types of shops in these places. Not only are there vending machines with every type of item from coffee to sunglasses, but they even sell jewelry and CDs outside in hawker stalls. However, I was not there to buy a techno remix of Gangnam Style nor get a brand new pair of knock off Oakleys. I was more interested in perusing the wide variety of Korean fast food each shop was offering. Naturally, there were a lot of fish products, but I saw something that perhaps was a bit of Konglish. It was a food labelled, “Hot Dog Pizza”. Now, coming from Chicago where we do both of those foods right, I was curious to see what the Koreans meant when they decided to put these two delicious items together. Turns out, there was nothing even remotely resembling a hotdog or a pizza involved in the snack. 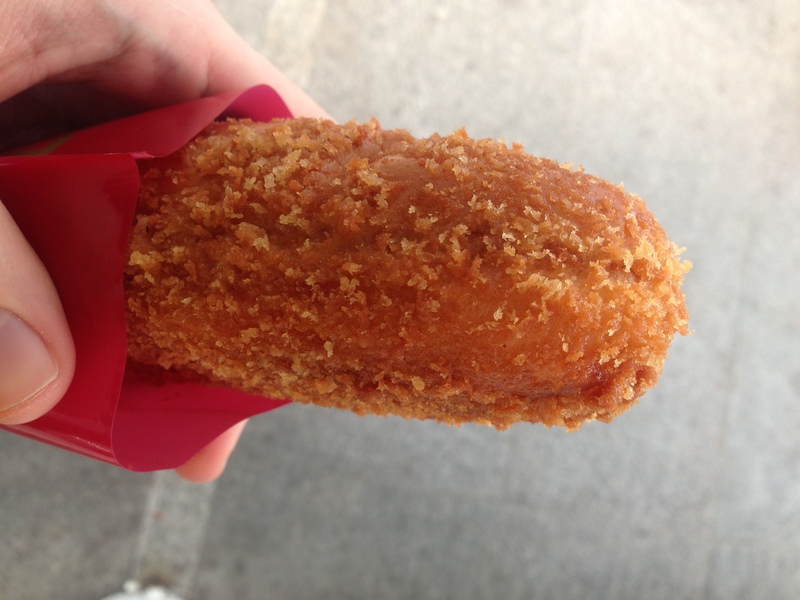 It was about a six-inch long tube of crunchy, fried, bread-crumb encrusted outside. 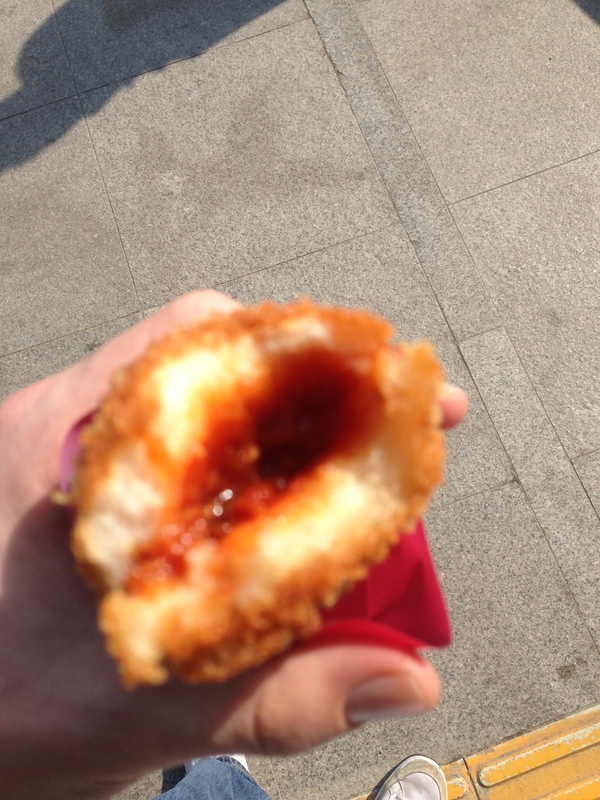 Then, I bit into a gooey center that did not contain a sausage of any kind. Instead, I was met with a slightly more viscous sauce that I could only liken to a Chinese-American sweet and sour sauce. It went well with the fried dough (as most fried things are inherently delicious) and left me satisfied. 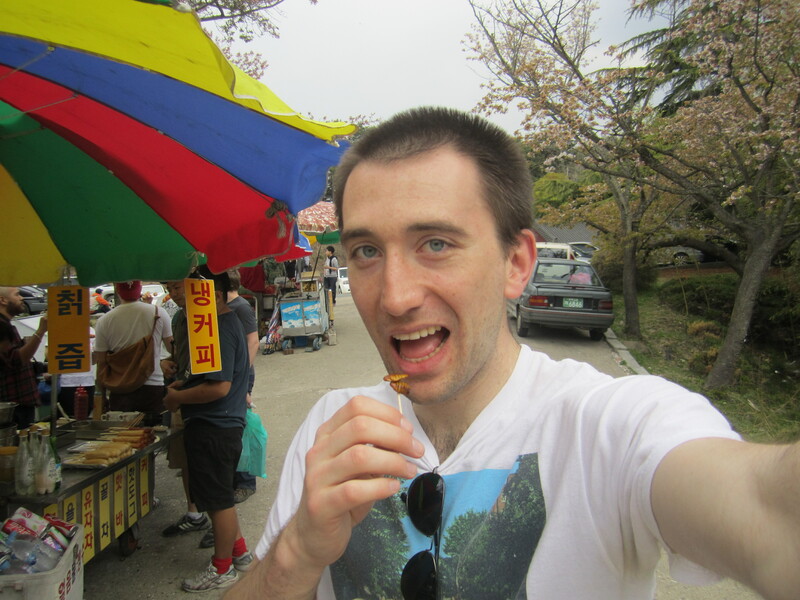 After we got to Gyeongju, we biked around the city for a couple of hours which led to us working up quite an appetite. So, we piled onto the bus for a ssam bap dinner. We weren’t sure what exactly constituted this meal, but thanks to our rudimentary Korean skills we at least knew that it contained rice because of the word “bap”. 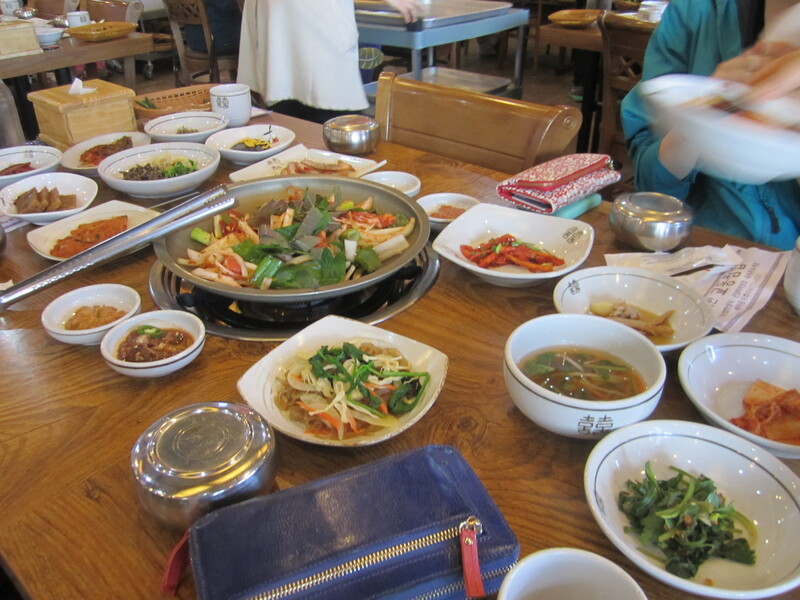 However, almost every Korean meal comes with rice, so it didn’t help us that much. When we arrived and sat down, we were immediately face to face with the international food of mystery. 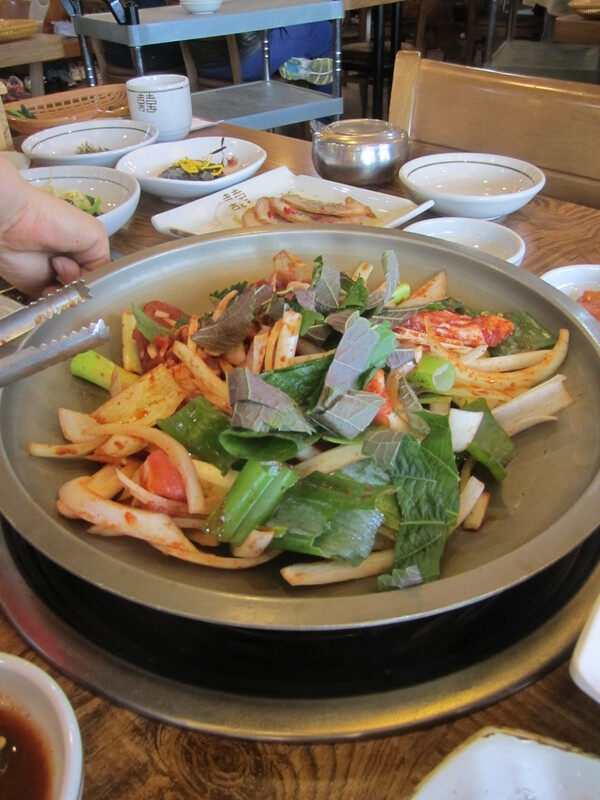 The ssam bap meal consisted of galbi and chicken mixed with various types of leafy green vegetables and grilled in a big metal bowl in the middle of our table. Once it was fully cooked, we took the meat and rolled it up in the lettuce and pepper leaves that were provided to us on the side along with other types of banchan like the omnipresent kimchi, sour bean paste, pickled radishes, a green salad with sweet sesame dressing, and seaweed soup to name a few. I should have had more rice, but I was still hungry after the meal. However, it was more of a case of quality over quantity as the semi-spicy chili sauce the chicken was marinated in really brought some intense savory flavors rushing over my palate. It was countered with the smooth, cool texture of the lettuce leaves. While this dinner seemed par for the course in terms of Korean dinner, what I ate the next morning was anything but normal. We rose early to a drizzly morning, but we still decided to see the grotto to see a giant carved Buddha statue. As we were walking back from the amazing sanctuary, I saw people in my group were getting corn dogs and hot dogs. I, being the natural weirdo that I am, saw beondegi in a pot next to the tube steaks everyone else was buying. You might be wondering what beondegi is, and it is not for the squeamish. It ‘s boiled silkworm pupae or little worm babies in layman’s terms. I don’t know if I’m foolish, crazy, and/or brave, but it was an interesting experience. They were a little bigger than kidney beans and possessed an amber hue. I popped them into my mouth, and their exoskeletons were crunchy. The insides were the tough part to stomach because texture-wise they were like smooth mashed potatoes, but the taste was somewhat overwhelming. It tasted like hay smell mixed with manure mixed with a slight nutty undertone. 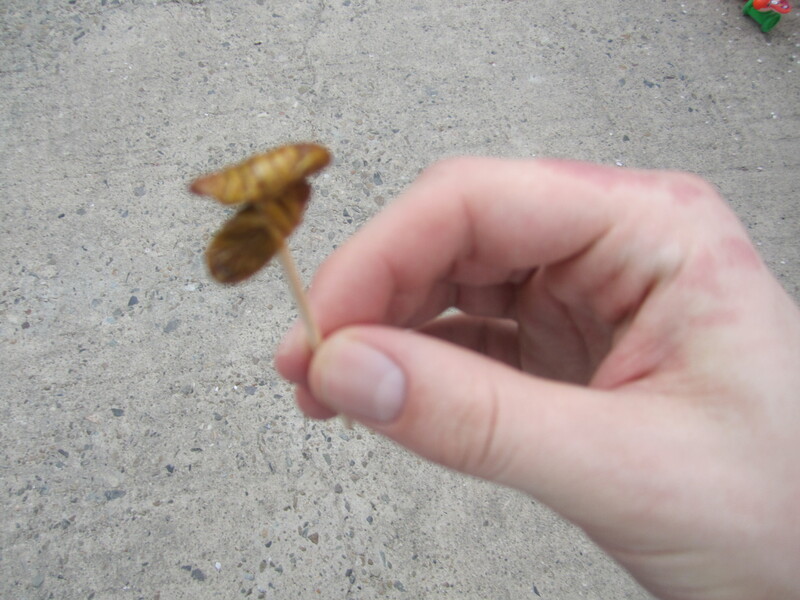 I’m glad I didn’t buy a whole cup of these little buggers, but it was worth the experience like the whole weekend making unforgettable memories.